With a noise level of only 9-17 dBA at top speed, the SP280XT is one of the quietest 2U rackmount fan models available. The low noise makes this fan suitable for noise sensitive applications from home AV to professional studios. And with airflow pushing at 28-64 CFM this fan can cool the hottest racks! The Intake model SP280XT blows air into the rack. The Exhaust model SP280XT-E pulls air from the rack. Procool model SXT80 fans are temperature controlled automatic on/off with variable speed, ranging from 1200 RPM to 2400 RPM at full speed. 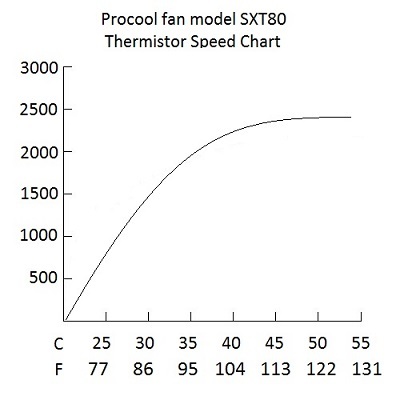 SXT80 fans have a temp sensor that should be located on or near the heat source. The sensor tells the fan when to start and stop and how fast to run. 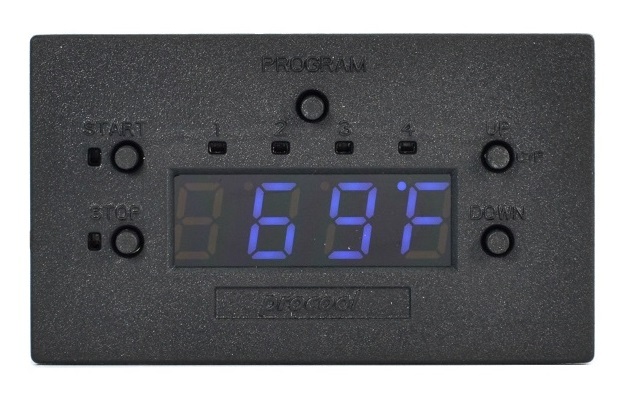 When the sensor detects heat above 75-77°F the fan will start. 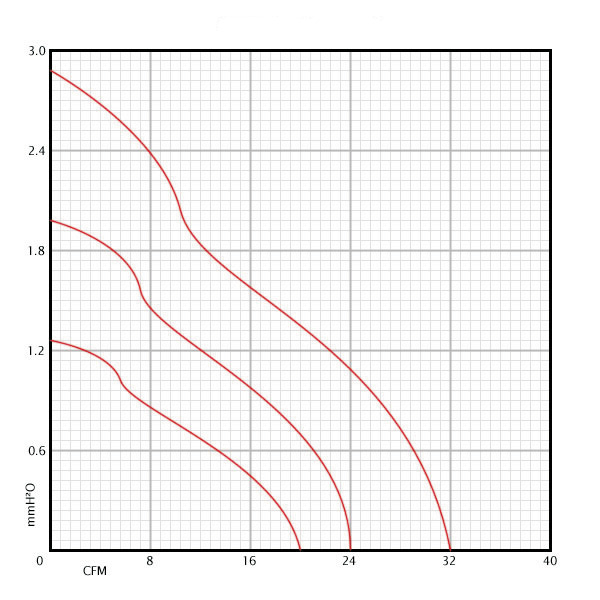 As heat increases the fan speed will increase. 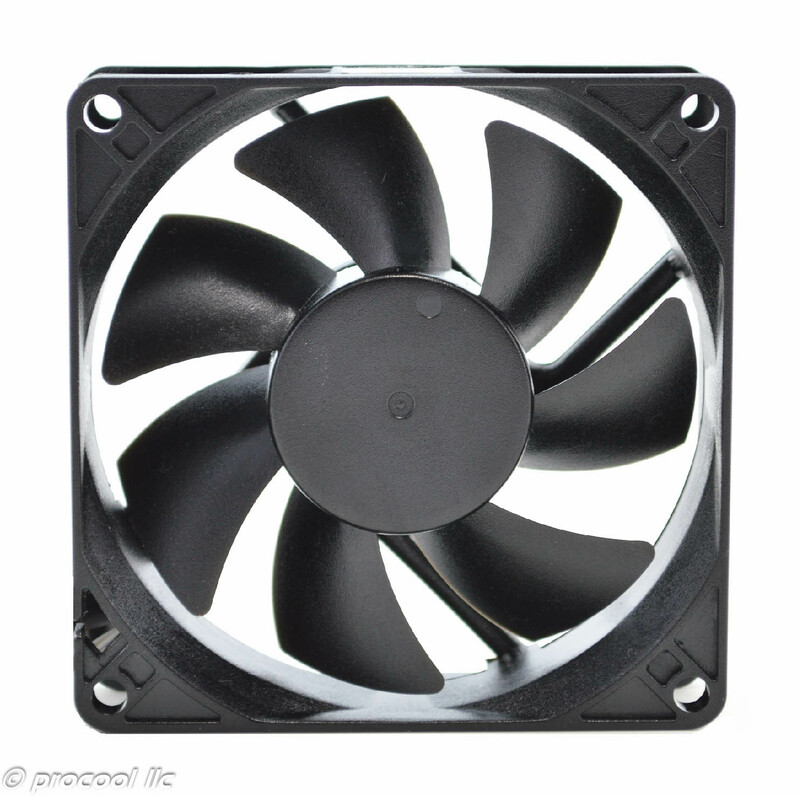 The fan will reach full speed of 2400 RPM at about 104-107°F. 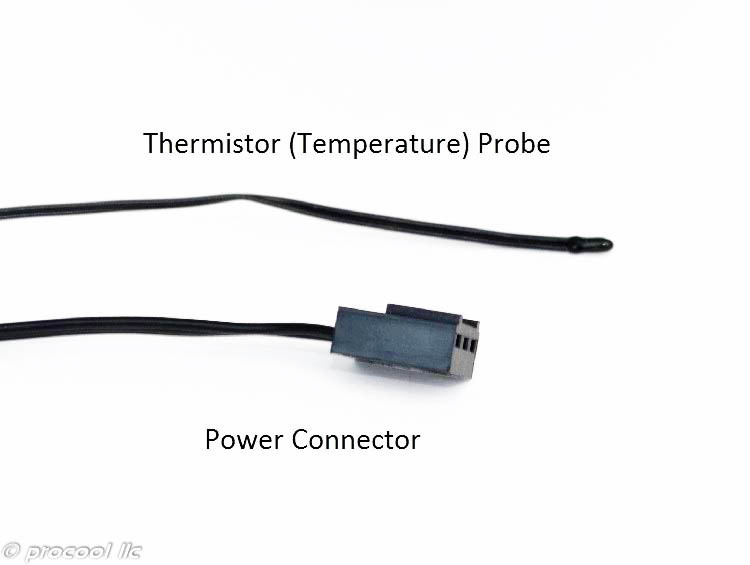 The fan temp sensor can be moved closer to the heat source to optimize or fine tune fan operation. As temperature levels drop the fan will slow down. Once the temp falls below 75-77°F the fan will shut off. See the chart below for illustration. Note that temp ratings have a +/- 3% variance. 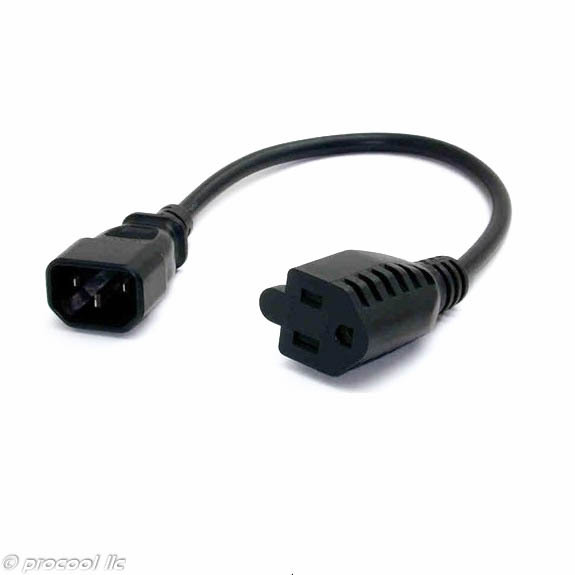 AC Cable plug types: NEMA 1-15P to IEC320C7 (figure 8) The AC cable 60 in. and is removable. Fan Thermistor wire length: 24"
Power Supply Cable length: AC-60" DC-36"
To maintain optimal performance, keep the fans clean. Canned air works well. If the fans are used outdoors or in a dusty environment is recommended to clean the fan blades as needed to keep clean. For cleaning and maintenance, the blade prop can be removed. Grasp the blade prop and pull straight out of the fan body. Inspect the shaft and lubricate if needed. Any oil will work; light grease works best. Clean blade as needed with a dry cloth. Soap and water can be used if needed, but should be thoroughly rinsed and dried before use. Reinstall the blade; when properly installed the blade will snap into place. 1. Is the controller display on? If Yes, skip to #3. 2. Check the power connections. The power supply has a green led indicator, it should be on. If it is not check the power source. If not lit or flashing, it would indicate power supply failure or no power source power. 3. Check that the fan plugs are all plugged in on the back of the controller. 4. Check the fan blades to make sure they are fully seated in the housing. Press on the center of the blade and push in. If it is not seated you can hear it snap into place. 5. Turn the fan blade by hand to see if they are stuck. They should be free moving. 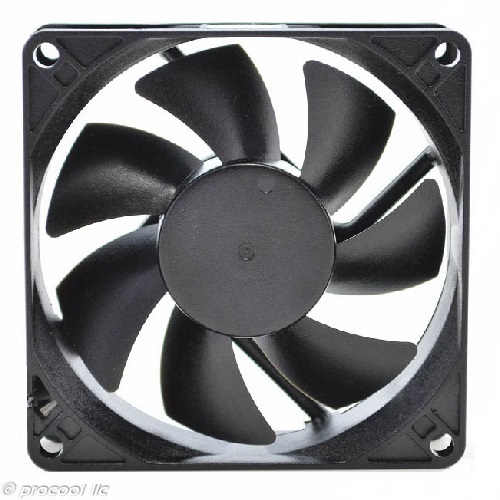 If this starts the fan it is likely the fans need maintenance.